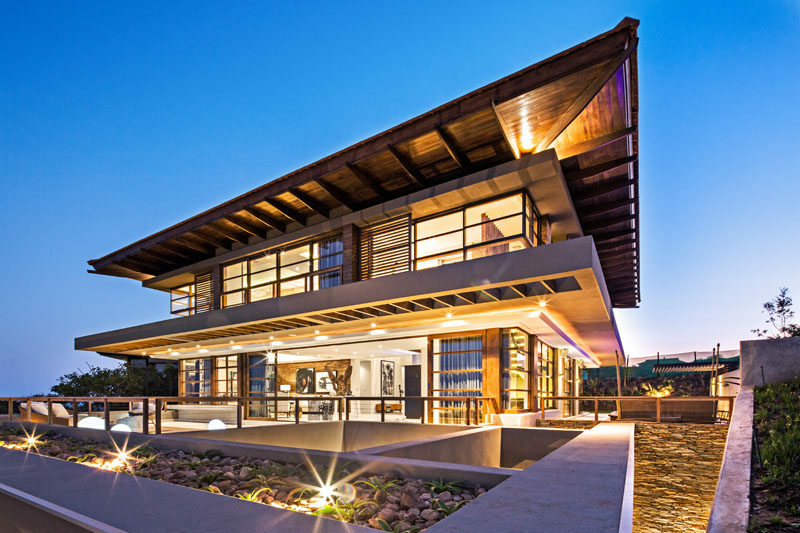 Metropole Architects have recently completed a house that sits on an ocean view property, north of Durban, South Africa. 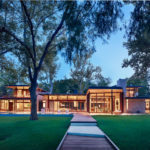 The house was designed in accordance with Feng Shui principles, with the shape, position, orientation of all the spaces and bodies of water all reflecting this. At the front of the house and off to the side, there’s a wood walkway surrounded by plants and rocks, that leads to the front door. Stepping inside the front door, you enter into the lower floor of the house, where there’s a double garage, storage area and a staff area. 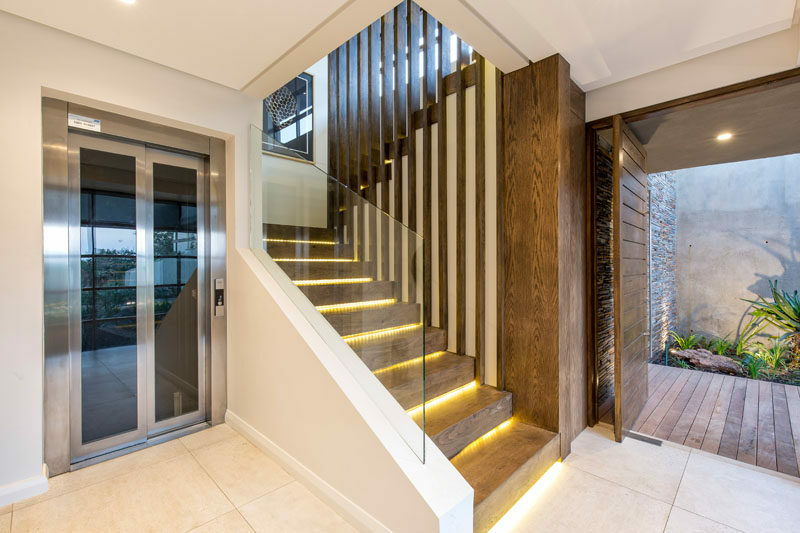 There’s also a set of stairs with hidden lighting and a lift that lead up to the main floor of the house. 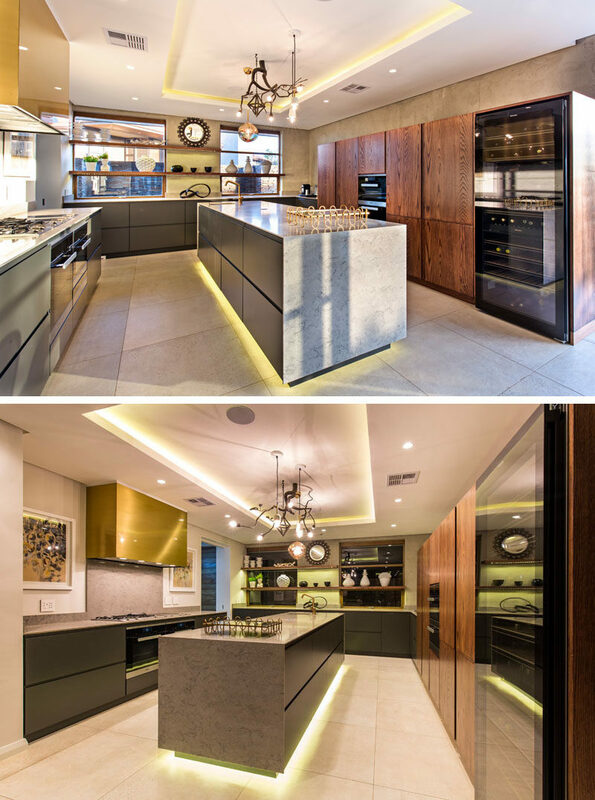 Interior design firm Ann Alderton Bespoke, completed the interior design of the home that includes a luxurious and sophisticated interior with a touch of glamour, but also serving the needs of a growing family. 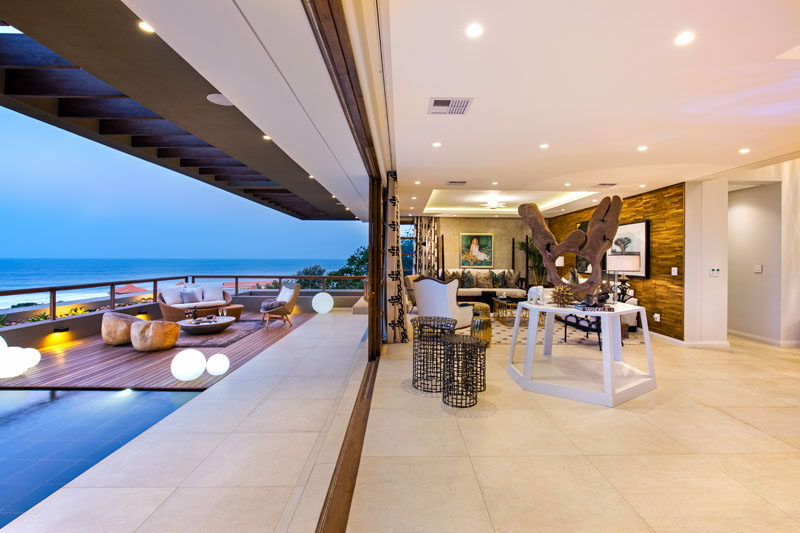 Just of the lounge, there’s a rim flow swimming pool with a natural stone waterfall feature and a sundeck. By placing these elements at the side of the house, they are shielded from the winds coming off the ocean. 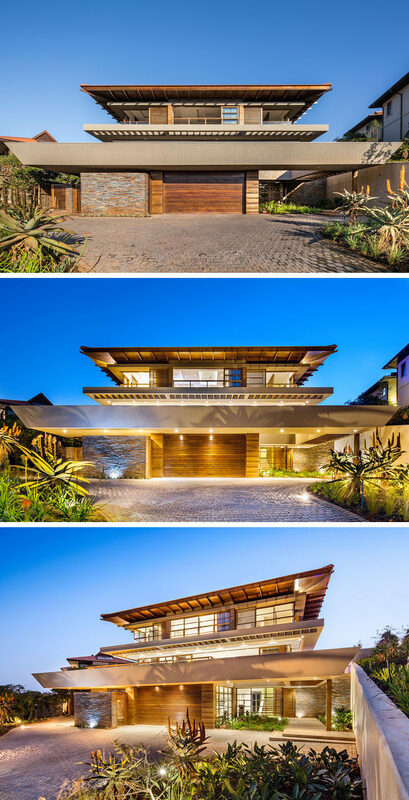 Around the corner and looking at another side of the house, you can easily see the roof forms with large eaves, an overhanging upper storey, and at night, light is used to highlight the design. 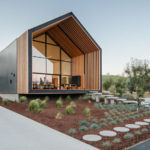 On this side of the house, there’s panoramic sea views from the north east through to the south east, and an outdoor lounge area and shallow reflective pool provide a calming place to relax. Stepping back inside the house through the large sliding doors is another sitting room. In the kitchen there’s hidden lighting in the recessed ceiling as well as under the the kitchen island. Upstairs, the large open plan master bedroom suite has a private lounge with a wood accent wall. Expansive sliding doors and windows open up the bedroom to take full advantage of the sea views. In the master bathroom, the space is open plan with the glass enclosed shower, bath, double-sided vanity and closet all sharing the same room. 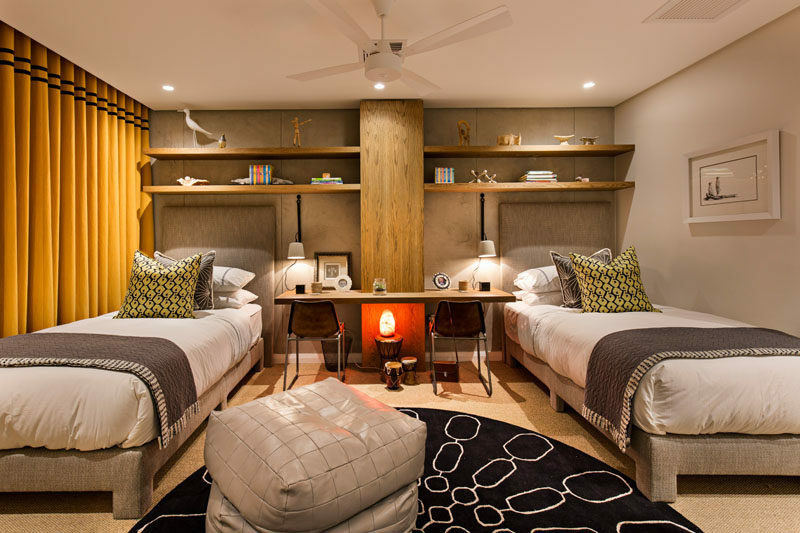 In another bedroom, the room has been set up for two people to share. One side of the room is the mirror opposite of the other, with them both sharing a common desk area. 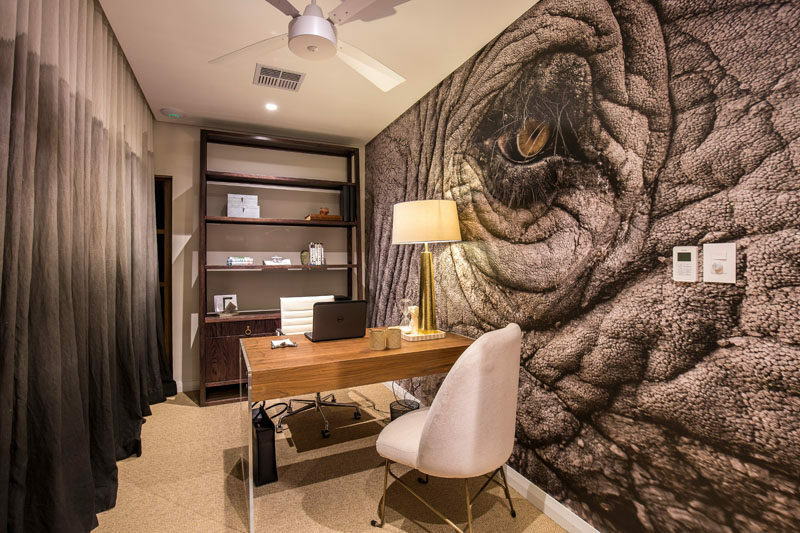 In the home office, a large animal mural fills an entire wall, while the curtains on the opposite wall compliment the colors found in the mural.